Cutting, Drilling, Casting and Molding Metals For DIY Projects can be a tough for a newbie for creating custom server chassis, custom devices or a scale model. So here is a guide for Cutting, Drilling, Casting and Molding Metals For DIY Projects which we started to lead a newbie with our previous guide for the proper workflow of a DIY or Crafting project. The major advantage is either to satisfy yourself or get a stronger thing than the default. If you can mold a metallic casing for your usual mobile, obvious it becomes more strong than a plastic case. At first glance, if you hear about Cutting, Drilling, Casting and Molding Metals, it will might scare you. But actually if you actually plan in the right way, find a closest already existing quite similar thing of any other material, it will ease for most of the usage. For creating own models on a series, it becomes important for opting for own setup to reduce the cost. You can seek the paid help from local tool machine workshop / Lathe Machine workshop, you might get the things more easily. Lathe Machine basically works on rotatory principle – its for symmetric things. For example it can create four symmetric wheels for your project with a central axis chopped away. For advanced CNC machines, programming is required. Here are the usual methods most commonly used for Cutting, Drilling, Casting and Molding Metals. Cutting Metals : Hacksaw, Cold Saw, Jigsaw are most commonly used tools. Oxy-fuel torches uses flame heat to cut away but adds several other problems, resurfacing is a big difficulty. The key with cutting is to measure rightly and mark properly. We usually use Vernier Calipers for precise measurement after rough cutting and then filing it to get the 99.5% accurate length. As metals changes in length with temperature taking at least mean of three readings is important. Drilling Metals : Everyone knows that drill machine exists. For fixing or inserting a screw or nut, a partial digger drill is touched to make a rack or rest for the nut or screw. 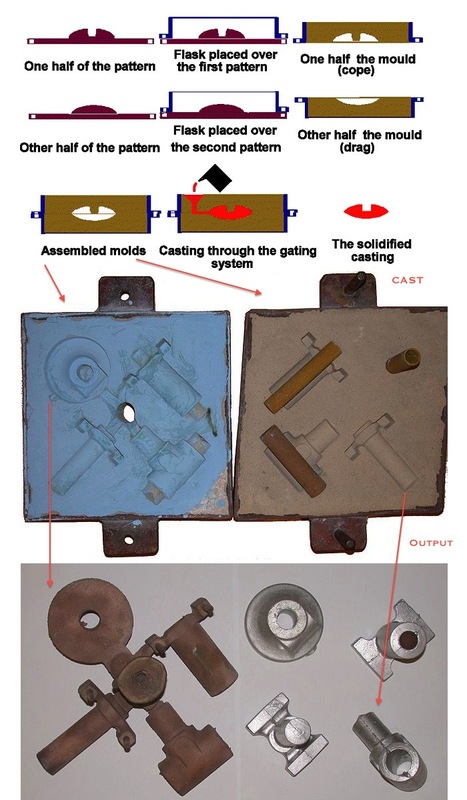 Another state of art method is Die Casting. Die Casting can be done with aluminum like metal with less setup. Cite this article as: Abhishek Ghosh, "Cutting, Drilling, Casting and Molding Metals For DIY Projects," in The Customize Windows, January 14, 2013, April 21, 2019, https://thecustomizewindows.com/2013/01/cutting-drilling-casting-and-molding-metals-for-diy-projects/.